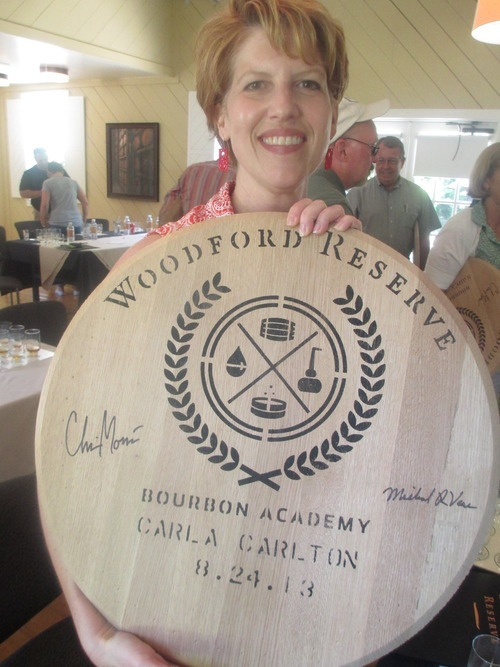 Summer school isn’t bad – in fact, it’s pretty great – when classes are held at the Woodford Reserve Bourbon Academy. My pal Stacey Yates from the Louisville Convention & Visitors Bureau and I headed to the beautiful distillery in Versailles, Ky., early Saturday morning for a full day of instruction led by master distiller Chris Morris, below. We explored regulations for whisky and bourbon, talked about chemistry and the culinary arts, discussed barreling and bottling, and zoomed through 250 years of bourbon history in 30 minutes with bourbon historian Michael Veach of the Filson Historical Society. 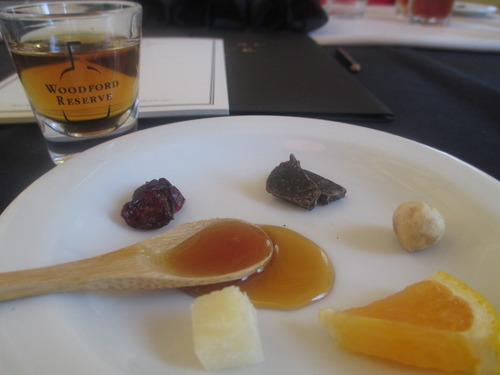 And, of course, we tasted bourbon. 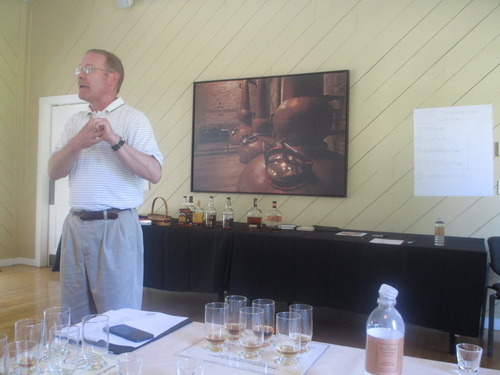 But first, we talked about the five sources of flavor: grain, water, fermentation, distillation and maturation. 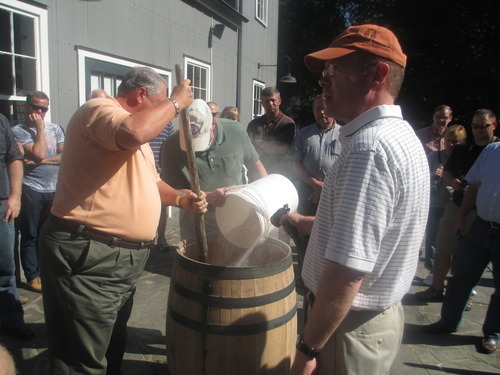 With the help of several of our classmates, Chris demonstrated how the Pepper family, the original distillers on the property, might have cooked mash in a barrel (the original “fermenter”), adding ground corn, rye and malted barley. 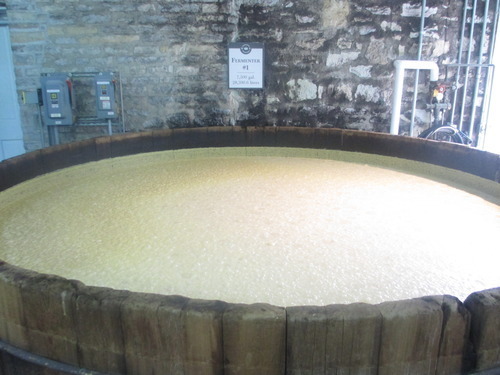 Then we tasted new make whiskey, or white dog (the distillate before aging), for three Brown-Forman products: Early Times, Old Forester and Woodford Reserve. 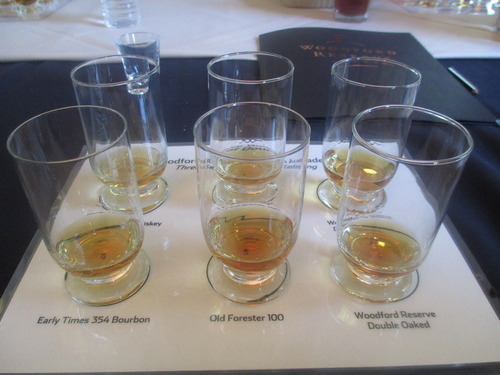 There were marked differences, even though Old Forester and Woodford share a mash bill. In the distillery, we stuck our fingers into the bubbling brew in the cypress fermenters (a sixth source of flavor?) 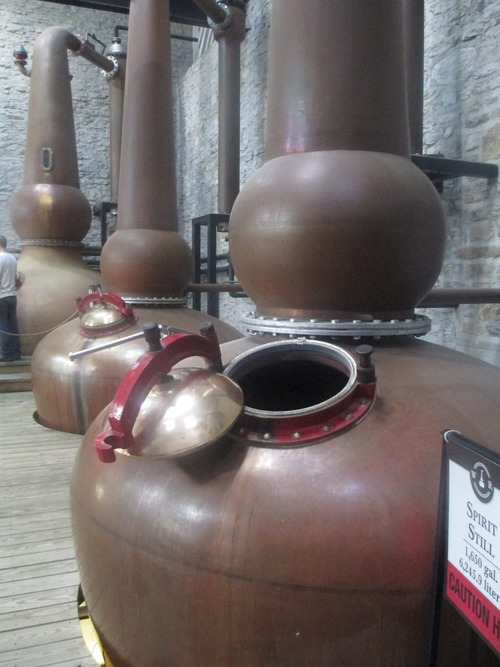 and learned that Woodford’s pot stills make a more complex spirit than column stills. Back outside, Chris explained how toasting and charring the barrel affects the flavor of bourbon by breaking down and crystallizing the sugars and the vanillin in the wood. 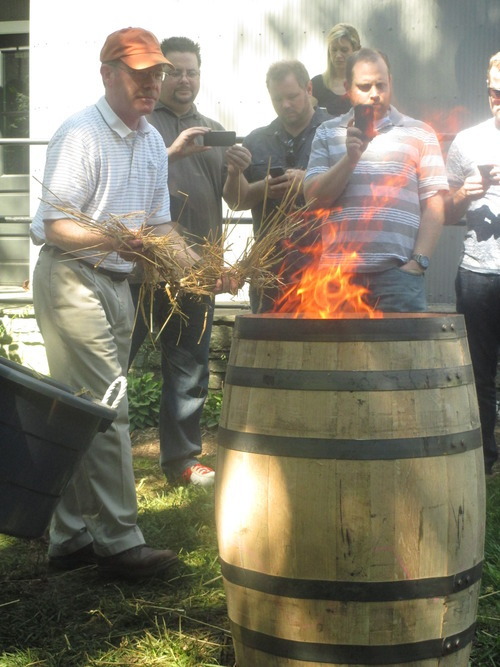 He demonstrated toasting by igniting some straw inside a barrel. 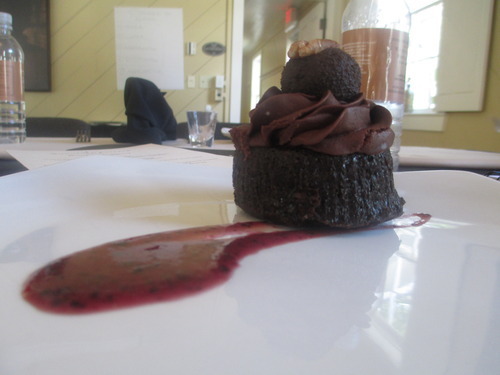 … we enjoyed lunch, which was capped by this rich, dense chocolate cake. After Mike’s history lesson, it was time for advanced tasting. We sampled the six products shown in the very top photo: Early Times Whiskey and Early Times 354 Bourbon, Old Forester 86 and Old Forester 100; and Woodford Reserve and Woodford Reserve Double Oaked. 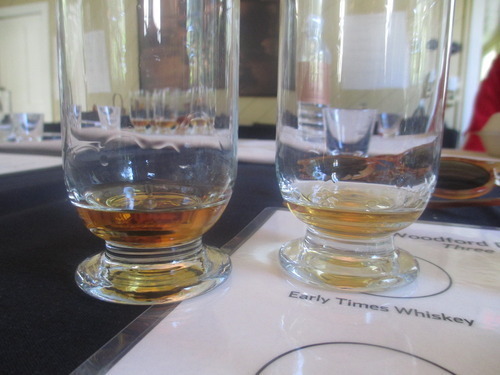 Chris led us in noticing the differences in each pair, such as the color difference between Early Times Bourbon, below left, and Early Times Whiskey, below right. The whiskey is partly aged in used barrels and therefore doesn’t pull as much color from the wood as the bourbon does. 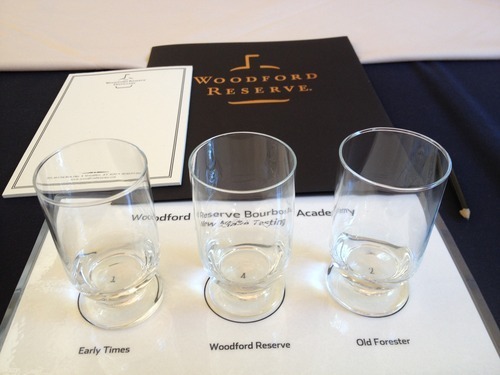 Woodford Reserve Bourbon Academy is held four times per year and costs $225 per person. The next one is Feb. 22, 2014. For details, click here. Be aware that they sell out quickly!